it's mid-summer. it seems that's usually when the slump begins. there's the heat, the boredom, and the car rides. 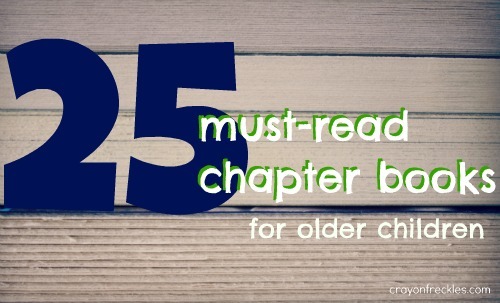 here are my suggestions on the 25 best chapter books to keep your older readers hands occupied and imaginations busy. What book would you choose for the last spot? I am pinning this! There are so many great books on this list that were my favorites as a kid...Boxcar Children, Sara,Plain & Tall, Mrs. Piggle Wiggle, Sideways Stories, Number the Stars! Great selections! I've been wanting to read chapter books to the kids, so this will give me a great start on what to choose! All my favorites are on the list, so I can't think of one for #25! Great list, Andie! My daughter wants to add, the Fudge books by Judy Blume for #25. My son says, any of the Goosebumps books by RL Stine. Little House on the Prairie series! Mrs. Pepperpot or The Girl Who Owned a School. I'm not sure if the book would deserve your 25th spot, but I know Austin must read "Crash" this summer for his reading project in September. They both love the Wimpy Kid series so they are always fun. lex, seems to like 'The Dork Diaries" which is a Wimpy kid version with girls! I love this list Andie I am so pinning this! I love the Little House books. We just finished reading the first one. Even my little 2yr old will listen, for a little while. I've only read a few of these. Wish I had more time, I would love to read these. Besides, I'm an older child too, at least in my heart :) Thanks for linking up to Mom's Library.